There may only be one new bracelet winner to tell you about after Monday’s 2018 World Series of Poker action, but there were plenty of other news-worthy happenings taking place within the Rio. Most notably, a two-time champion in the $50K Championship holding a dominating chip lead at the six-handed final table. Here’s everything you need to know about June 18. Our latest winner, Matthew Davis, is a statistics teacher at Chabot College in Haywood, California. 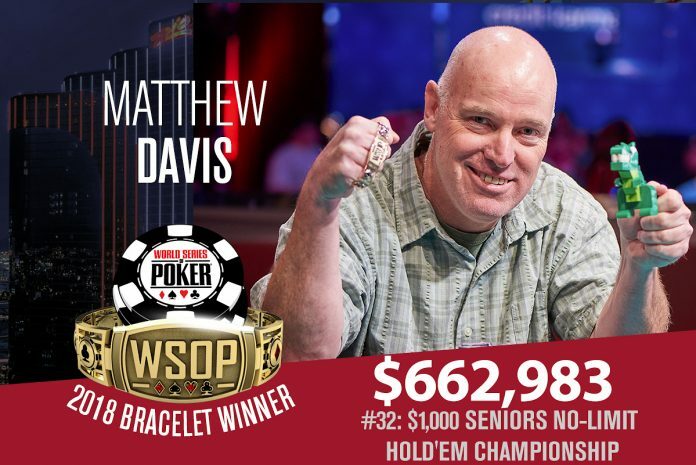 If you looked up his poker statistics, they’ll now show he’s a WSOP bracelet holder with $662,983 as his largest cash. This year’s Event #32: $1,000 Seniors No-Limit Hold’em Championship was the largest in history, drawing a massive 5,919 entries. Monday saw a crazy final table play out, complete with quads and big suckouts, and Davis was able to navigate his way through the hubbub on his way to the win. Joseph Schulman was the first player to exit, after a set over set encounter against Bill Bennett. Bennett would also eliminate Frank Berry in seventh too, when his ace-deuce out-flopped Berry’s ace-seven. Rachel Delatorre was next to go, under very unfortunate circumstances. She got all her chips in on a nine-high flop with pocket tens, and Davis called – also holding pocket tens. However, the turn and river gave Davis a flush. Bennett, start-of-day chip leader Gary Friedlander, and Scott Hamilton-Hill were the next to fall, leaving Davis heads-up with Bill Stabler, both even in chips. “I came and played my first WSOP event in 2007, and I managed to secure a little over a min-cash. And I was talking to my daughter afterward – she was in first or second grade – and she asked me how much I had to spend to enter the tournament, so I told her that it was a $1,500 event. If we’d forced you to put money on who you thought would be chip leading the final table of Event #33: $50,000 Poker Players Champion, chances are you would have picked Michael Mizrachi. After all, the Grinder has bagged the lead for the past two days running on his way towards a potential third victory in this event. Mizrachi does indeed lead with six players remaining, holding a massive chip lead of 8,865,000. His next closest competitor is Dan Smith with 4,485,000. Aaron Katz, Mike Leah, Benny Glaser, and John Hennigan round out the finale. Throughout the day’s action we lost the likes of Jean-Robert Bellande, Chris Vitch, Shaun Deeb, Brian Rast, and Phil Ivey. Greg Mueller was the official final table bubble boy, getting unfortunate to bust in 7th to Mizrachi after the Grinder rivered a straight against Mueller’s turned set in a limit hold’em hand. Action resumes at 2pm Tuesday, with all players guaranteed $191,234. The winner will receive $1,239,126. Play in Event #35: $1,500 Mixed Omaha came to an end Monday night with just three players remaining, all of whom will return tomorrow to play down to a champ. Yueqi Zhu holds a massive chip lead over Gabriel Ramos and Carol Fuchs, will the minimum payout now $89,488. They’ll want the $211,781 first-place prize though, and with 78% of the chips in play, China’s Zhu is in pole position. Fuchs is experienced though, having won her first bracelet back in 2015 when she took down the $1,500 Dealer’s Choice event. Matthew Gregoire (4th), Jon Turner (5th), and Peter Neff (6th) all busted the final table earlier in proceedings. After two starting flights, Event #34: $1,000 DOUBLE STACK No-Limit Hold’em played through its Day 2 today, bringing the 5,700 total field down to 162. Daniel Colpoys holds the overnight chip lead with 1,405,000, followed by David Kaiura with 1,237,000, and Yosuke Sekiya with 1,208,000. Other notables set to return tomorrow include Isaac Baron (942,000), Mike Del Vecchio (888,000), Andrey Zaichenko (819,000), Tony Dunst (571,000), Richard Dubini (125,000), Alex Rocha (87,000), and Maria Lampropulos (262,000). Throughout the day, the likes of Chris Moorman, start-of-day chip leader Brian Yoon, Greg Raymer, Steve Sung, Jeff Madsen, Gaurav Raina, David Bach, Andre Akkari, David Peters, Calvin Anderson, Felipe Ramos, Mohsin Charania and Kathy Liebert all hit the rail. Day 3 begins at 12pm Tuesday, with the min-cash currently worth $4,215. The winner will get $644,224. They’re down to 43 in Event #36: $1,000 Super Seniors No-Limit Hold’em, after 347 of the 2,219 field returned Monday for Day 2. Jerry Weber holds the overnight chip lead with 884,000, followed by Paul W Lee (573,000), John Borzio (523,000), Linda Iwaniak (521,000), James Brown (513,000), and John Erickson (502,000). A few players who busted today include Michael Moore (125th Place- $2,209), Konstantin Puchkov (180th Place- $1,972), Gary Benson (230th Place- $1,780), and Chris Bjorin (263rd Place- $1,625). All 43 players have $6,650 locked up, while the winner will get $311,451. Play resumes at 11am Tuesday. Event #37: $1,500 No-Limit Hold’em kicked off today, with 1,330 runners taking a shot. When all was said and done just 236 remain, and it’s Kirk Banks who will sleep the best. Banks bagged up a chip-leading stack of 179,100, but he’s followed by Michael Rocco (160,000), Duy Ho (158,500), Joe Couden (155,900), Anatoly Filatov (129,000), and Stephen Song (124,600). Barry Greenstein will return tomorrow, albeit with a very short stack of 11,500. Aaron Massey (97,000), Eoghan O’Dea (91,200), bestselling writer Maria Konnikova (88,200), and two-time bracelet winner Andy Frankenberger (80,300) will also be back for Day 2. Things get going again at 12pm Tuesday. Only 200 players will make the money, with a min-cash worth $2,249 and $319,580 plus the WSOP gold bracelet for the winner. Another event that kicked off on Monday was Event #38: $10,000 Seven Card Stud Championship, and it brought out 76 entries. After ten 60-minute levels, it’s Ben Yu who bagged the chip lead with 280,000. He’s followed by Daniel Negreanu (212,000), Al Barbieri (208,000), and Scott Seiver (202,500). Just 27 players now remain, with the likes of Anthony Zinno, Jason Mercier, Nick Schulman, David Benyamine, Andre Akkari, Shaun Deeb, Ray Dehkharghani, Jeff Lisandro, Eli Elezraand, and Adam Friedman hitting the rail throughout the day. Defending champ Mike Wattel will be back tomorrow though, bagging up 154,500. Registration is still open until the beginning of Day 2, tomorrow at 2pm. If all of the above action wasn’t enough for you, there are two brand spanking new events set to get started on Tuesday. Kicking off at 11am is Event #39: $1,500 No-Limit Hold’em Shootout. Shootout formats are always popular at the WSOP, perhaps for the novelty factor, or perhaps because the days tend to be shorter. Then, a bit later at 3pm, there’s Event #40: $2,500 Mixed Big Bet. That tournament sees players play a rotation of No-Limit Hold’em, PLO, 2-7 NL Lowball, NL 5 Card Draw, Big O, PLO Hi-Lo, and 2-7 Pot Limit Triple Draw. Players are allowed one re-entry.